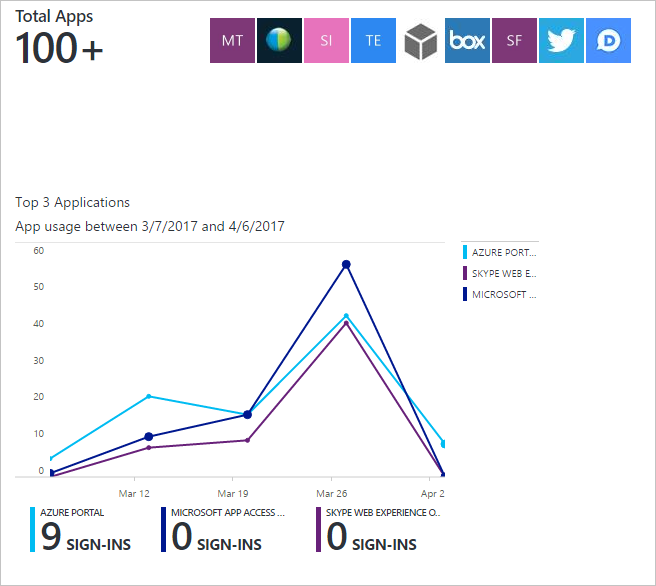 Sign-ins – Information about the usage of managed applications and user sign-in activities. Audit logs - Audit logs provide system activity information about users and group management, managed applications and directory activities. This topic gives you an overview of the sign-ins report. 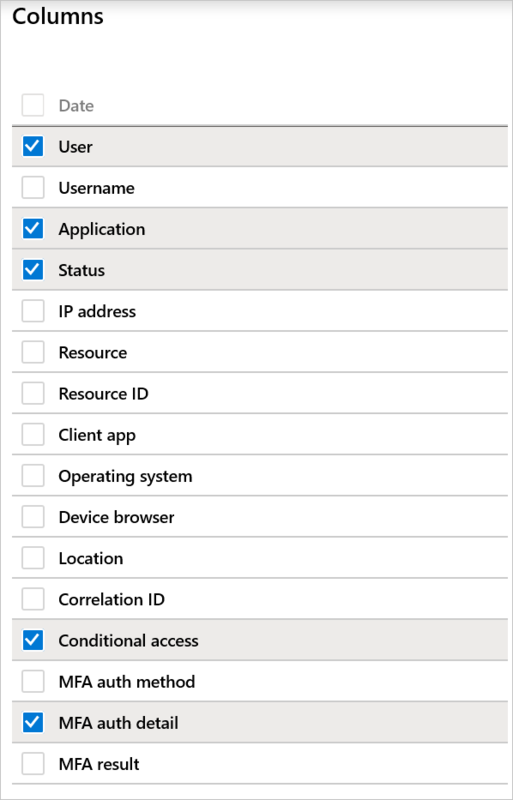 What Azure AD license do you need to access sign-in activity? 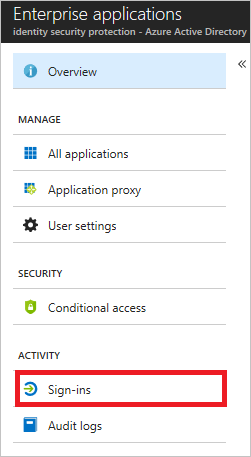 Your tenant must have an Azure AD Premium license associated with it to see the all up sign-in activity report. 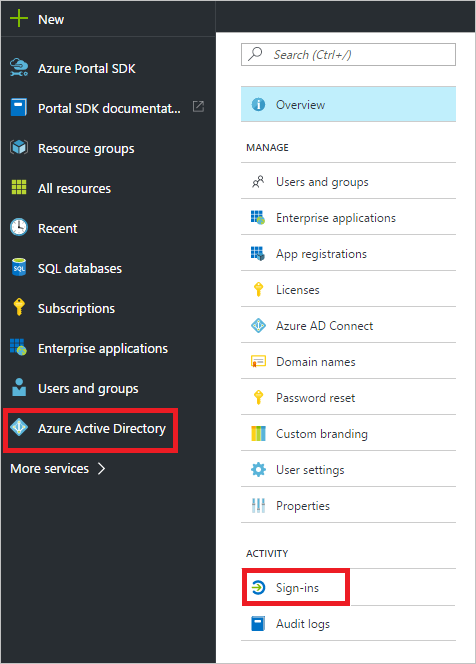 See Getting started with Azure Active Directory Premium to upgrade your Azure Active Directory edition. Note that if you did not have any activities data prior to the upgrade, it will take a couple of days for the data to show up in the reports after you upgrade to a premium license. What is the sign-in pattern of a user? How many users have signed in over a week? What’s the status of these sign-ins? 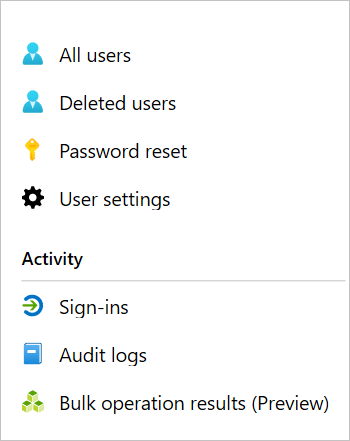 You can access the sign-ins report by selecting Sign-ins in the Activity section of the Azure Active Directory blade in the Azure portal. Note that it may take upto two hours for some sign-in records to show up in the portal. The sign-ins report only displays the interactive sign-ins, that is, sign-ins where a user manually signs in using their username and password. Non-interactive sign-ins, such as service-to-service authentication, are not displayed in the sign-ins report. 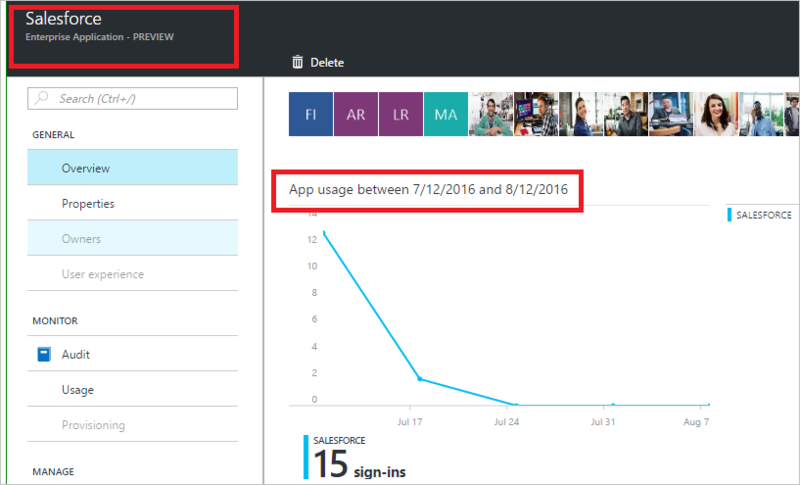 Customers can now troubleshoot conditional access policies through all sign-in reports. 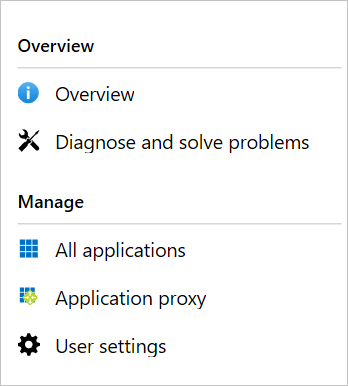 By clicking on the Conditional access tab for a sign-in record, customers can review the conditional access status and dive into the details of the policies that applied to the sign-in and the result for each policy. For more information, see the Frequently asked questions about CA information in all sign-ins. The User filter enables you to specify the name or the user principal name (UPN) of the user you care about. The Application filter enables you to specify the name of the application you care about. The Date filter enables to you to define a timeframe for the returned data. You can download the sign-ins data if you want to work with it outside the Azure portal. 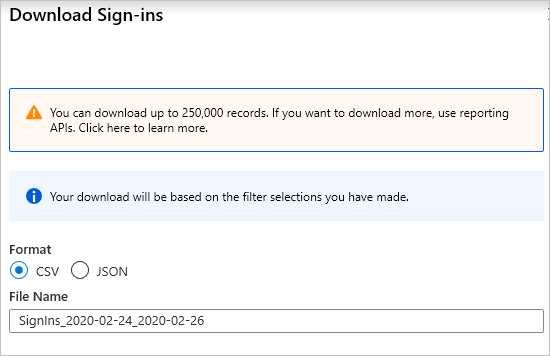 Clicking Download gives you the option to create a CSV or JSON file of the most recent 250,000 records. The number of records you can download is constrained by the Azure Active Directory report retention policies. The user sign-in graph in the Identity security protection overview page shows weekly aggregations of sign-ins for all users in a given time period. The default for the time period is 30 days. When you click on a day in the sign-in graph, you get an overview of the sign-in activities for this day. What application was the target of the sign-in? What is the status of the sign-in? What is the MFA status of the sign-in? IP addresses are issued in such a way that there is no definitive connection between an IP address and where the computer with that address is physically located. Mapping IP addresses is complicated by the fact that mobile providers and VPNs issue IP addresses from central pools that are often very far from where the client device is actually used. Currently in Azure AD reports, converting IP address to a physical location is a best effort based on traces, registry data, reverse look ups and other information. On the Users page, you get a complete overview of all user sign-ins by clicking Sign-ins in the Activity section. Who is using my applications? What are the top 3 applications in your organization? I have recently rolled out an application. How is it doing? Your entry point to this data is the top 3 applications in your organization within the last 30 days report in the Overview section under Enterprise applications. The app usage graph weekly aggregations of sign-ins for your top 3 applications in a given time period. The default for the time period is 30 days. If you want to, you can set the focus on a specific application. 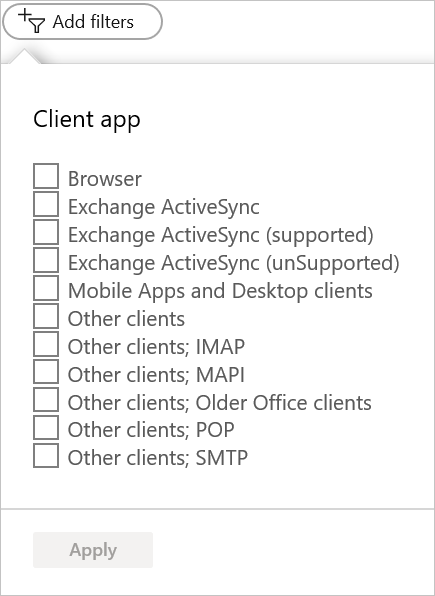 When you click on a day in the app usage graph, you get a detailed list of the sign-in activities. The Sign-ins option gives you a complete overview of all sign-in events to your applications.